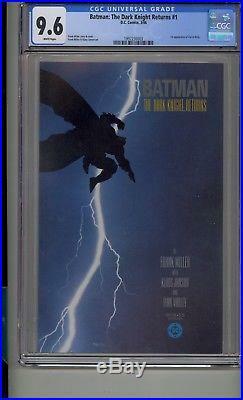 The item "BATMAN THE DARK KNIGHT RETURNS #1 CGC 9.6 FRANK MILLER 1ST PRINT" is in sale since Wednesday, January 16, 2019. This item is in the category "Collectibles\Comics\Copper Age (1984-1991)\Superhero\Batman". The seller is "absolutecomicsandstatues" and is located in Rego Park, New York. This item can be shipped worldwide.